Zunes at Woot: Cheap Cheap Cheap! Deals site Woot.com is offering up refurbished (Microsoft Recertified) Zune 30s for just $80 plus $5 shipping. That's a whole 30 gigabytes of fun and an awesome scratch-proof casing. 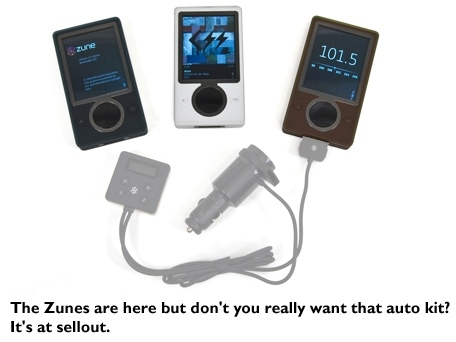 Not to mention the latest Zune software update: quite a bargain! If nothing else, you might want to check Woot to see their infamous ad copy ruthlessly mock the 30 GB model and its inability to keep time this past New Years. That, and the excellent v2 Car Pack is available for just $10 plus $5 shipping from sister site sellout.Woot.com. As with all Woots, it's only sold until the end of the day or they run out--whichever comes first. And judging by past sales, this tends to happen pretty quickly.